Ion scattering spectroscopy (ISS) is a technique in which a beam of ions is scattered by a surface. 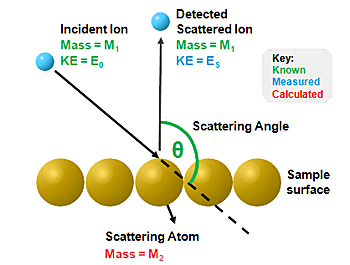 The kinetic energy of scattered ions is measured; peaks are observed corresponding to elastic scattering of ions from atoms at the surface of the sample. Each element at the sample surface produces a peak at a different measured kinetic energy, caused by the momentum transfer between the incident ion and atom. The scattered ion and the scattering atom are normally of different masses, but the total momentum of the atom and ion is conserved. Therefore, as the initially "stationary" atom recoils, some kinetic energy is lost from the scattered ion, and the quantity of lost energy depends on the relative masses of the atom and ion. Experimental geometry for ion scattering spectroscopy. An ion scattering spectrum typically contains one peak for each element in the sample, with their separation in energy relating to the relative atomic masses of those elements. In some cases, different isotopes of the same element can be resolved, although this usually requires a primary ion heavier than He+. Strong scattering signals are limited to the topmost layer of atoms, so ISS is extremely surface-sensitive. Therefore, the sample must be clean, and even a small quantity of surface contaminant can significantly influence the ion scattering spectrum. The absolute kinetic energy (ES) of each peak also depends on the energy of the scattered ion beam (E0) because ISS is an energy-loss technique. The relevant quantity when dealing with ISS is the ratio of the scattered and incident ion energies, E/E0. The angle through which the ions are scattered (θ) is also important. Where the ion source and detector are fixed, the angle is a parameter that must be included in the calculations. The equation below shows how the energy of a scattered ion peak is related to the other relevant factors. For a given instrument, θ is normally a constant (it is ~130° on the Thermo Scientific ESCALAB Xi+ instrument, because the angle between the ion gun and the input lens is 50°). M1 is constant for a given source gas, which is usually He, but sometimes Ne, Ar and other inert gases are used. E0 is normally constant in a given experiment. Therefore, this equation can be used to determine the mass of a scattering atom, M2, from its peak position in the spectrum or to predict the position of a peak for a given atom. Sometimes, E0 is unknown at the start of an experiment. The solution is to calibrate the energy using a standard sample, preferably of a pure, metallic element for which M2 is known, such as gold. Once the scattered peak energy from the standard sample is measured, the only remaining unknown is E0, which can be calculated. Once E0 is known, the main aim of ISS is usually to associate scattered peaks of energy ES with atoms of mass M2. The equation may be simplified to a quadratic equation in (M2/M1). This can be rearranged to produce the equation below. 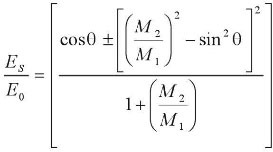 This equation may be used to determine the mass of a scattering atom from the kinetic energy of its ISS peak, once the primary beam energy has been calculated. Thus, the primary beam energy is determined to be 937 eV. Substituting these values results in a value for M2 of 63.7, and, therefore, the peak is from copper. The ES/E0 ratio varies with atomic weight of the surface atom and the nature of the primary ion. Example ion scattering spectra from Cu, Ag and Au, using He+ ions of 970 eV energy and a scattering angle of 130°. All specimens were mildly etched to remove most of the carbon and oxygen contaminants. The copper and silver ISS spectra show some residual oxygen presence at ~400 eV KE. The Ag spectrum has some structure at ~60 eV. The low KE region of ISS corresponds to sputtered ions of Ag, which contribute to a high intensity, low kinetic energy spectrum from 0 to 200 eV KE. Ion scattering spectrum from a phosphor-bronze sample showing the presence of oxygen, copper and tin. This spectrum was acquired using He ions at 1 keV. Noble gases are usually used for the primary ions in ISS, which avoids contamination of the surface that would occur if a more reactive material were used. From the above equations, the only surface atoms that can be detected are those having a greater mass than the primary ions. Helium, therefore, provides the widest mass range, and hydrogen is the only element that cannot be detected. 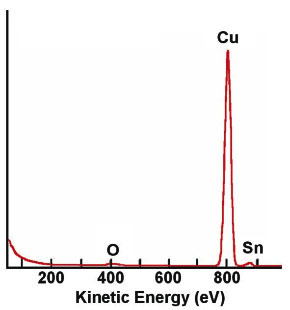 Because the separation of mass decreases with atomic weight, in the figure above, there is an energy separation of approximately 400 eV between O and Cu but less than 100 eV between Cu and Sn. 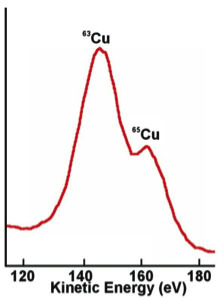 This result is produced even though the mass difference between Sn and Cu is much greater than that between Cu and O. If better mass resolution is required, then it is necessary to use a noble gas ion that is as heavy as possible while still being lighter than the target atoms. 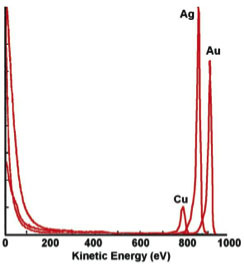 Using argon ions, for example, on the same sample as that in the figure above can provide sufficient mass resolution to distinguish between the two copper isotopes. Ion scattering spectrum from a phosphor-bronze sample showing the presence of two copper isotopes. This spectrum was acquired using Ar ions at 1 keV. 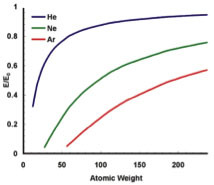 Helium as an ion species for ISS enables the determination of elemental composition; however, unit mass resolution is lost for all target atoms heavier than Na, caused by the physics of the scattering process. Inherent FWHM of peaks near E0 are usually 2% of E. In general, mass resolution decreases rapidly with increasing mass. Mass resolution also depends on the range of angles from which ions are collected. Although the first phosphor-bronze spectrum was obtained using a collection angle of 20°, this had to be reduced to approximately 3° to obtain the second spectrum. The energy spread in the ion beam will also affect mass resolution as will the degree of collimation of the beam.